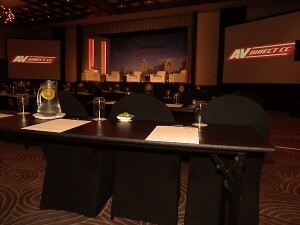 We were proud to supply audio visual equipment for the Hotel Investment Conference Africa 2013. 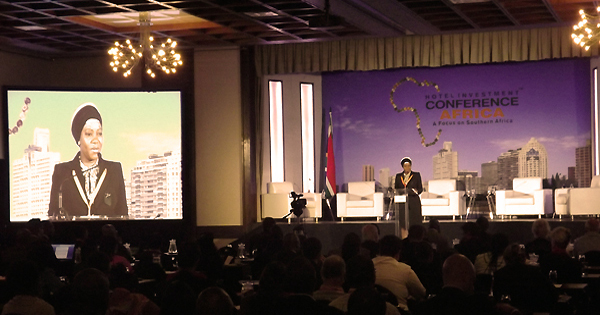 The conference took place at the beautiful Elangeni Hotel which was transformed into a 200 strong conference session over two days, it included panel speakers from hotel owners, brokers, financiers and lawyers. 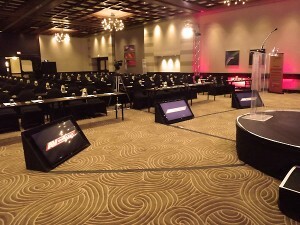 We setup two large-format projection screens using Christie LHD700 Full HD video projectors. 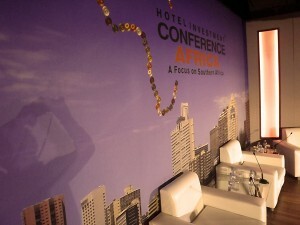 The stage was setup with a 6m x 3.4m branded backdrop, set light-boxes and fold-back comfort LCD monitors for the presenters. 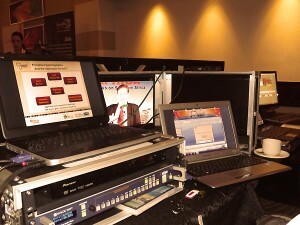 A 5-way delegate microphone system was installed on the stage which gave the panel control over the debating and Q&A sessions. At front-of-house we setup using the Analog Way Pulse 300 digital scaler for HD switching between presentation and live video feed. Lighting dimmers were controlled using Martin Light-Jockey system while audio processing was done using Soundcraft’s GB4 16-Channel mixing console. There was also an audio feed provided for the international broadcast, as well as, staging and sound for the evening’s entertainment at Docklands.